Ninety-degree temps, and three days spent by Table Rock Lake at Piney Creek Wilderness. Some much needed rest & Recuperation time. This entry was posted in Backpacking, Campfire Chat, Our Backpacking Trips, Places We've Been, Summer and tagged Backpacking, Hammock Camping, Piney Creek Wilderness on July 27, 2018 by Gary. July 21 I took Luke for an afternoon kayaking on the James River at Springfield, Missouri [12 pictures]. This entry was posted in Our Kayaking Trips, Paddling, Summer and tagged Ascend D10, Great Blue Heron, Greene County, James River, Kayak, Missouri, Ozarks, Paddling on July 21, 2016 by Gary. This entry was posted in Plants, Spring, Summer and tagged blue, Blue Eyed Grass, Flower, Ozarks, Sisyrinchium campestre, Spring, summer, White, Wildflower on April 9, 2012 by Ginger. 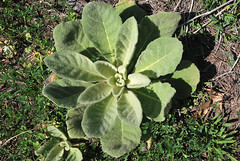 Common mullein is just that. Common. You’ve seen this everywhere from old fields to vacant lots. It is an introduced plant, originally from Europe, and can sometimes spread heavily in disturbed, weedy areas. This entry was posted in Plants, Summer on April 9, 2012 by Ginger.